As 2016 saw the Summer Olympic Games in Rio de Janeiro, the Parkes Library history blog will focus on Olympians from the Parkes Shire. Each post will provide a snapshot of the sportsmen and sportswomen who have worn the green and gold and called the Parkes Shire home at some point of their lives. The 2016 Rio Olympic Games saw two former Parkes Shire residents making their Olympic debut. Hockeyroo Mariah Williams has been featured already (click here) This post focuses on marathon runner, Scott Westcott. Scott’s story is one of perseverance and taking your opportunities when they are presented to you. Scott is also the oldest Australian Olympian to make his debut at an Olympic Games. Scott Westcott was born 25th September 1975 and grew up in Alectown, son of Lawrie and Sue Westcott. Growing up on a farm, he was always running around after the sheep. 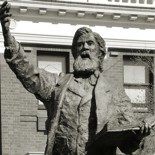 Westcott, who now lives in Newcastle, grew up on farm at Alectown near Parkes in the state’s central west. His mother, Sue Westcott said he honed his running skills on the family’s merino wool growing property, along with his two brothers and one sister. Mrs Westcott said her son has had the Olympic dream since childhood. The dream seemed to be within reach, when in 1993 Sydney were awarded the 2000 Olympic Games. 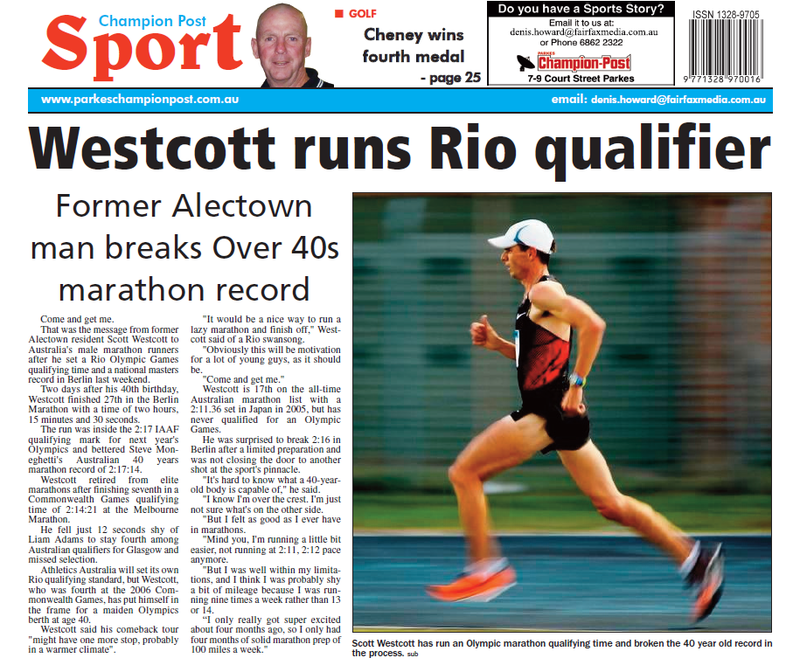 Westcott’s tortuous quest to make an Olympic team began in 2000, when he had B-standard qualifiers for the 5000m and 10,000m in 1999, but ran poorly at the trials. 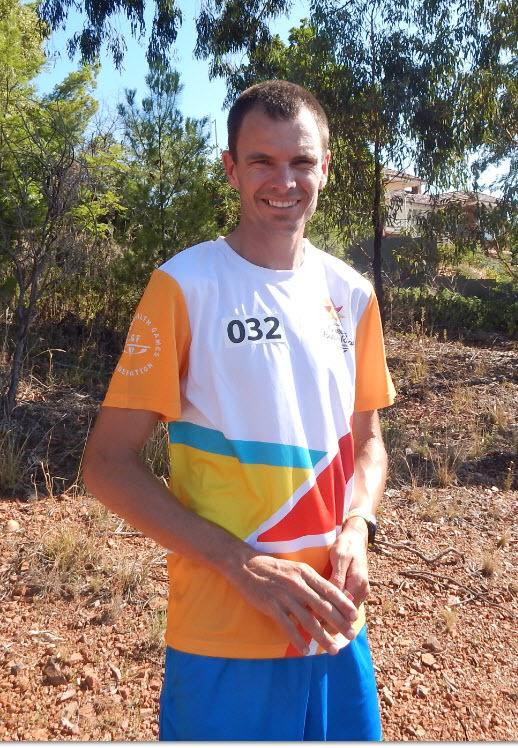 He ran two hours, 13 minutes and 30 seconds to finish 14th in a breakthrough race at the London Marathon in 2004, placing him fourth among Australian qualifiers for the Athens Games. He was 27th at the world championships in 2005 and fourth at the 2006 Commonwealth Games in Melbourne. In 2008, he ran 2:13:36 in Japan, outside the Australian A time of 2:12:00, but well inside the B qualifying time and the international standard. He was ranked second, but Australia took only one male runner, Lee Troop, to Beijing, along with three women. Westcott had a motorcycle crash at the end of 2011, which affected his training during the qualification period for London 2012. He prepared for the 2012 Melbourne Marathon as if it was his last, but won the national title in 2:16:00. The run qualified him for the 2013 world titles and rekindled his career, although he missed the world meet after the birth of his third child. He ran 2:14:21 in Melbourne in 2013 and was third-fastest qualifier for the 2014 Commonwealth Games in Glasgow, but again he missed out on selection. However a birthday gift from his family resulted in a bonus present. The Berlin Marathon, the fastest course in the world, was being held two days after Scott’s 40th birthday. His family’s present was entry into the event. Scott ran the course in Olympic-qualifying time. Our own Scott Westcott is being forced to endure an enormous amount of obstacles to make his Olympic marathon dream come true. 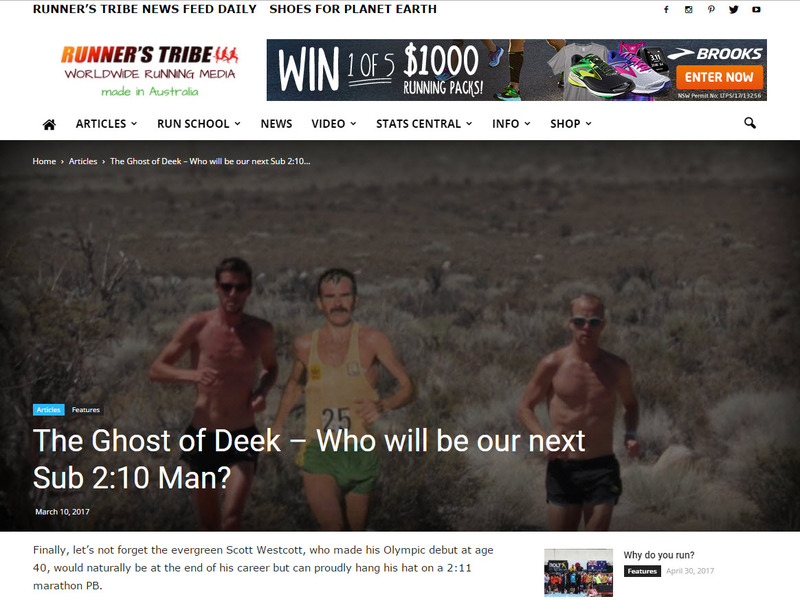 Firstly, Scott had to run a time under 2:10:00 to be eligible for the Rio games in August. He has done that. Secondly, he had to be one of the top three fastest qualifiers in the allocated period to be considered by Athletics Australia (AA) for the three-man team. Scott was third fastest qualifier. He was then nominated for the team by AA and everything looked to be finally going Scott’s way….Finally Athletics Australia saw fit to select him and put his name forward for the Rio team last week. Now a non-nominated athlete has appealed not being selected. That has set the announcement of the team back a fortnight and I am sure it is also giving Scott sleepless nights. Scott shared his experiences as his debut Olympics approached. A daily blog, 100 Days to Rio, allowed family and friends to receive an up close encounter with an Olympian in training and preparation. If you have stories or memories that you are willing to share about Scott Westcott or any of the other Olympians of the Parkes Shire , please contact Parkes Shire Library via library@parkes.nsw.gov.au so that they can be shared and kept for posterity on this blog. Alternatively you may leave comments on this page. 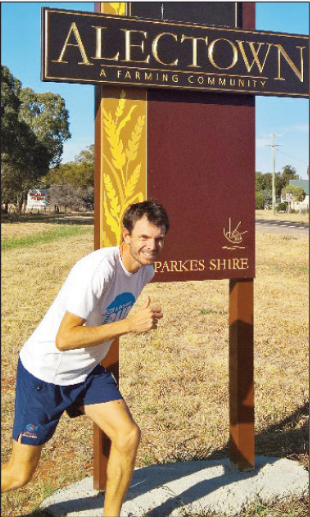 This entry was posted on August 25, 2016 by parkeslibrary in 1990s, 2000s, 2010-2015, Alectown, comeback, controversy, famous people of Parkes Shire, General history, Olympians of the Parkes Shire, Olympic Games, Parkes, Parkes High School Athletics Carnival, Rio Olympic Games 2016, Rotary Fun Run, Uncategorized and tagged 100 Days to Rio, 2000 Olympic Games, 2006 Commonwealth Games, Adamstown, Alectown, Alectown Ace, athletics, Athletics Australia, Berlin Marathon, Brazil, Commonwealth Games, Copacabana, family, famous people of Parkes Shire, history, Lawrie Westcott, local reaction, marathon, Mariah Williams, Melbourne marathon, NSW Athletics, Olympic dream, over 40s, Parkes, Parkes Champion Post, Parkes High School, Parkes Shire, Parkes Shire Council, Parkes Shire Library, Rio 2016, Rio de Janeiro, Rio qualifier, Roel ten Cate, Samsung commercial, Sue Westcott, Westcott family.